Hot Applied Waterproofing is the most commonly used method of waterproofing roof surfaces. It has been used to waterproof flashing conditions on new roofs and roof restorations for some time. It creates a seamless, nearly impenetrable water-tight seal that rivals none. Waterproofing a roofing system is critical to the longevity of the roof itself. It deters the harmful effects of mold, and rotting from water collection, and protects the overall structural integrity of the building. It is more dangerous to install than cold applied waterproofing systems, as it requires extreme expertise due to fire hazard and intense heat. 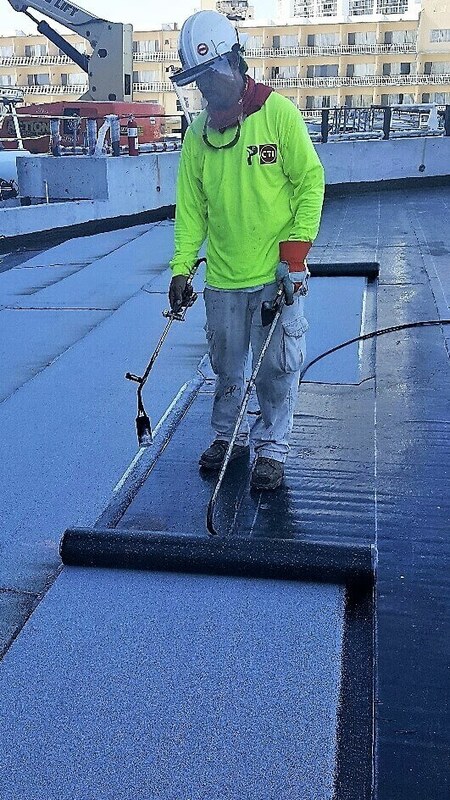 Due to the extreme nature of installation, Hot Applied Waterproofing Systems should only be installed by exceptionally skilled and trained professionals such as those employed by Pinnacle A Roofing Company. We hire only the most skilled technicians and train them to perform installations safely and efficiently. We are qualified installers for Soprema Colphene H Hot Rubber System, and Carlisle Hot Rubber Systems. These can be applied in plaza decks, split slab conditions or planter areas of the plaza decks. We can provide up to 20 Year warranty on these assemblies.